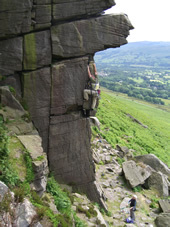 The Peak District has some of the finest climbing in the UK, featuring easily accessible limestone and gritstone crags. There are literally hundreds of classic routes to choose from, with different climbing styles that need to be mastered. Dan works as a freelance climbing instructor, holding the Single Pitch Award (SPA). Dan holds the Climbing Wall Award (CWA) which is aimed at both teaching groups to climb safely and also looks at coaching good climbing movement. The Peak is well served with some of the best climbing walls in the country. Dan regularly uses The Works climbing wall to run bouldering sessions. It is great to be able to concentrate on teaching good climbing movement without the need for ropes. 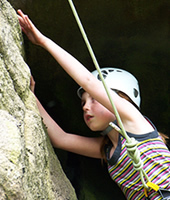 The Climbing Works is a well thought out climbing space well equipped with safety matting. Dan runs regular sessions at the Edge and the Foundry in Sheffield, these are walls requiring the use of ropes. Sessions can be run to suit the ability of the group. It is a great place to learn how to safely belay. Dan uses the BMC FUNdamentals syllabus to coach novices and improvers. Having the opportunity to start teaching good technique when climbers are young is an advantage, although it is never too late to improve. Dan actively encourages and teaches the group how to critique each others climbing technique. Learning how to spot good and bad climbing movement, and learning to accept advice, helps us all to improve. Dan has been involved in youth work for many years and works regularly with Church youth groups and school groups. 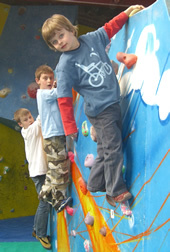 He has run regular climbing sessions for both teenage groups, juniors and pre-schoolers.